So Nintendo makes a lot of great games, right? Of course they do, I don’t even have to wait for your confirmation. It’s clear from the first sentence that this is gonna be another totally biased review isn’t it? Good, just making sure. I guess that this paragraph has gone to waste, like so many before it, thanks to my unremitting rambling. Ha. Unremitting. And some people say that the thesaurus is a waste. Now I look pretty smart, or at least I think so. And now to get back on topic. (Off topic in the first intro paragraph? New record?) I’ve been playing a lot of games lately, and few of them have been suiting my needs wholly. I mean sure, Return of the King is pretty good, and Secret Collect has its moments, but I’ve been looking for something a little more… fantastic. And that’s where my good friends at Nintendo come in. I’ve rented two games (that I can remember) in the last two months, and they’ve both been very good to me. The first was Mario Party 5, which was, nay is absolutely astounding. Its single-player modes are much better than those of previous installations, and the multiplayer is possibly even better than Super Smash Bros. Melee. And seeing as how much I love SSBM, that’s a damn good game. 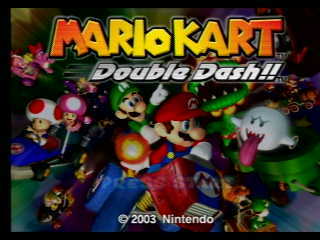 But the second is the one I chose to review, and that is Mario Kart: Double Dash!! So now that we’ve got the topic, let’s get to it! Here we have the newest, and unquestionably the best of them all. With all of the new things it brings to the table, and the old and improved stuff too, this Mario Kart is the racing game that everyone should be playing. I’m not sure exactly where to start, since I’ve got so much to work with. So I guess I’ll just go ahead and show you the first pic. Ah, this is the title screen. But not the title screen you’ll be seeing, as it changes to this one once the game has been completed. But that’s of no importance, seeing as there is much more to the game than the title screen. And now we shall delve into that gamey goodness, starting with the basics of gameplay. First thing is the Grand Prix mode. This is the meat of the game, and can be played with one or multiple players. I’m not sure if you can unlock stuff with more than two players, as I haven’t tried it. So the first decision you’ll have to make is which engine size you wish to play with. For your reference, 50cc is easy, 100cc is medium, and 150cc is hard. Next you pick your characters. “Characters? With an S?” you ask. 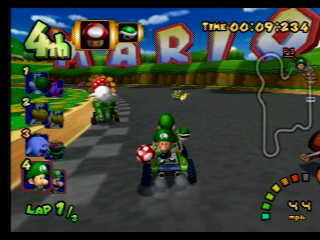 Yes, each kart has two characters in it this time around, making for some great multiplayer gameplay. As you can see in the pic above, there are enough players to choose from to rival a fighting game’s roster. Only, when you start, four of them won’t be there. Once you’ve picked your guys, you get to choose a kart to ride in. Kart choices very depending on which characters you chose. 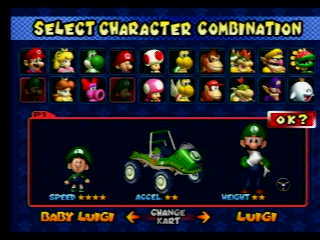 My personal favorite team is Luigi and Baby Luigi with the Green Fire kart (which needs to be unlocked). Oh, and one last thing, each “set” of characters has their own special weapon, so choose wisely. Next you get to choose which cup you’re going for. Obviously, the Mushroom Cup is the easiest and so on. The last two cups, the Special Cup and the All Cup Tournament, have to be unlocked, just so you know. 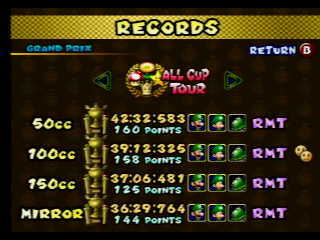 Personally, my favorite is the All Cup, just because it gives you the chance to race everywhere, and it even randomizes the order in which you race the courses. Otherwise, I think the Mushroom cup, just for the sake of simplicity. Now there are a lot of little things you should know before starting, just so that you have an edge. 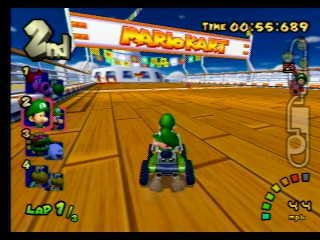 Firstly, at the beginning of a race you can get a speed burst by hitting the A button at the right time. Veterans of any Mario Kart game should know this little trick. Secondly, when drifting you can acquire a small speed boost by tilting the control stick back and forth. Once you see blue sparks, you can let go and zoom away. I was trying to demonstrate this in the pic above, but Bowser jumped in the way just as I clicked the “take photo” button. Damn attention hog. The rest of the game is pretty simple, and I don’t think I should have to tell you what to be doing. Anybody who’s played a previous Mario Kart should have no trouble getting used to this one, as it’s the same style of game, and they’re all pretty similar. Of course, there are a couple of new weapons, but they’re all special weapons specific to each set of characters. 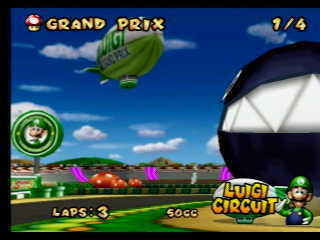 In the shot above, you can see that Luigi’s got a Fireball, which is his (and Mario’s) special. Some others are just old weapons that are now character-specific. So if you’re looking for a triple-shell, you have to be the Koopa Troopa. 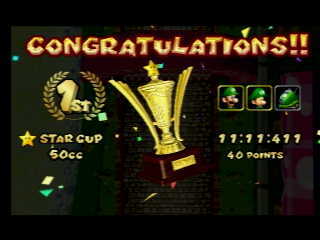 Now I imagine anyone should be able to win all the gold trophies in the 50cc class, as it is exceedingly easy. Heck, you should be able to do it with perfect 40’s on every cup. If you can’t then I’ll hunt you down and make you play until you can!! Consider that a threat. If you can’t do perfects on the other engine sizes, it’s okay, they’re harder and it’s more acceptable. Even I don’t have all perfects on 150cc. Yet. 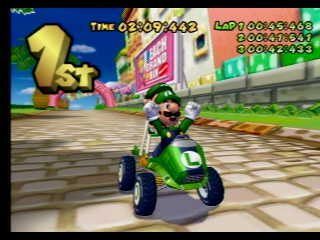 Okay, now we’re gonna start the course summary with, oddly enough, the first course; Luigi Circuit. This is just a plain old rubber band-shaped track. 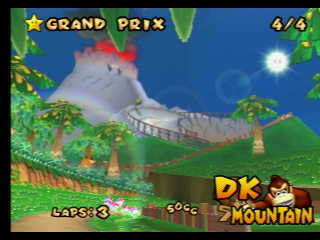 There isn’t a whole lot that makes it special besides the Chain Chomp and the many boosters along the turns. 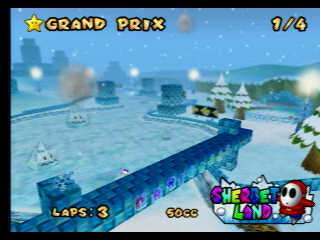 On 100cc and above, the wall in the center of the track is gone, and there are “shortcuts” on the sides, but in this game, shortcuts are rarely any shorter than the long way, and they’re usually more dangerous too. In this case, they do nothing. It’s still an easy course to win though. Next up is Peach Beach. This is a very nice beach that looks like it came straight out of Super Mario Sunshine. (Not unlike most of the rest of the game.) It’s got a Pianta statue/fountain, a huge warp pipe, and those damn annoying duck things. They’re way deadlier in this game than they were in SMS, but they’re still pretty easy to dodge. The shortcut in this level requires a Mushroom to use properly, as it forces you to drive through deep water. Now that I think of it, it’s more of a long cut. Just follow the normal track and while you’re at it, ignore the warp pipe unless you’re in 1st. This is one of my favorite courses, Baby Park. Though saying that is a bit contradictory, as I hate Nascar racing for being a big loop, just like this course. 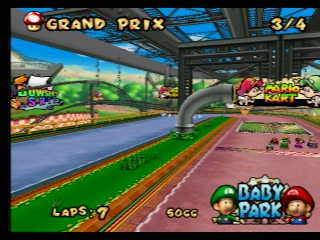 The difference is that in Mario Kart you’ve got weapons to make the race more fun, and on this course, weapons will make or break you. Since it’s so small and open, there will be a ton of shells and bananas all over the track after the first couple laps. It’s still pretty easy to win if you know how to drift properly, even on 150cc. 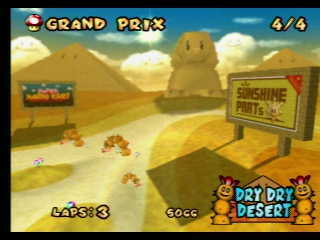 The last race of the Mushroom Cup is the Dry Dry Desert. It’s very much like the Dry Dry Desert in Super Mario 64, as it’s filled with Pokeys and has a rogue tornado wandering around. There are a lot of s curves in this one, and as I’ve said before, drifting is the most important skill to learn. At one point there’s a huge sand pit which is hard to get out of if you get in too far. If you do manage to start falling in, just let yourself get eaten, as struggling will just make your respawn take longer. Most of the Pokeys are off to the sides and won’t pose a problem until the end of the course. 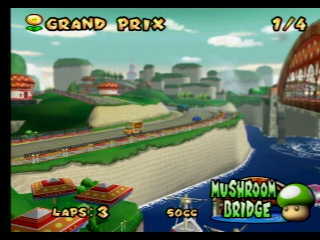 The Mushroom Bridge is a tricky course, as there are plenty of cars, and 3 almost useless shortcuts. The first is right at the start; you just turn down some stairs and go through a pipe. It’ll only help you if you’re already in 1st. The second goes up a dirt path which slows you down, again being no help at all. The last one is the hardest to do, but actually works quite well if you pull it off. Once you’re coming out of the second tunnel, you can drive up on the bridge supports, which are covered in boosters. The only problem is that it’s very, very thin and you’ll fall off 90% of the time. My recommendation: just race normally, and shoot the Bob-omb cars just after you pass them to give your opponents an explosive surprise. The next track is the Mario Circuit. The pic doesn’t show much of the course (like most of them), and it doesn’t show any of the important parts. There is a Chain Chomp like on the Luigi Circuit, plus Goombas and Piranha Plants scattered on the last half of the track. 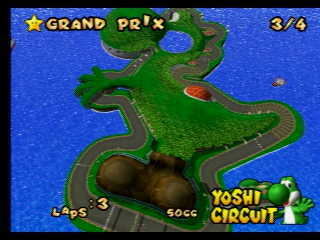 Like most tracks, the only shortcut here involves using a Mushroom to drive off-road. 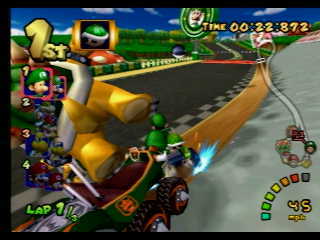 It’s actually a tough course on 150cc, as this is where the AI players start to get good. 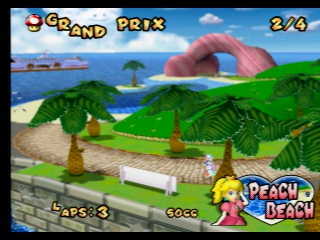 You could see the Daisy Cruiser from Peach beach, and now you get to race on it. While it is just another uninteresting track, the Daisy Cruiser provides a couple opportunities to get ahead of the competition. Firstly, you can go right around the pool instead of taking the long left path. In the boat, tables shift back and forth, and if you’re playing against humans, they might get hit by one. AI players will always swerve around, possibly knocking you into one. Lastly, there’s a hole in the floor at one point, and you can fall in to get shot out to the deck, but it doesn’t really help at all, because the fall slows you down a lot. 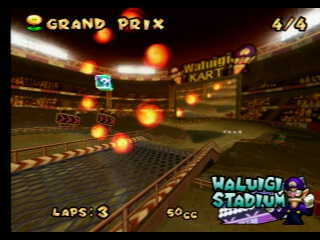 Waluigi Stadium is the best course in the Flower Cup because it’s got a lot of jumps, hazards, and item boxes. It’s a difficult race to get 1st in on 150cc, but it’s still a fun place to race in. There are fire hoops over a couple of the jumps, and if you pass though, you’ll be rewarded with a double-item box. The giant Piranha Plants that re about ¾ of the way through don’t make you spin out, they just make you stop dead in your tracks, so you’re better off getting burnt that hitting one of them. The Star Cup’s first track is also the prettiest looking track in the game. Sherbet Land is a snow-covered paradise, and it’s also a lot more deadly than it looks. The Shy Guys will make you spin out if you hit them, and at the end the freezies will freeze and spin you. This is the first course that made me annoyed with the eyes on everything. Trees? Okay. Pyramids? It’s a bit of a stretch, but okay. It’s when the walls have eyes and noses that you start to think that maybe somebody at Nintendo has a drug problem. The Mushroom City course is one of my favorites. I’m not sure why, but it is. Like the bridge, there is a lot of other traffic here, most notably the giant Wiggler bus. A neat trick is that if you hit a Mushroom Car, a Mushroom will pop out onto the track! Near the end, there is a small dirt path which you can take if you don’t feel like navigating the traffic anymore. And never, ever drive down the road from where the traffic spawns; it just warps you back to the starting line as if you’d fallen in water. I hate Yoshi Circuit. It’s got a lot of hard S turns and the AI is really good at this one. If you get a Mushroom, save it until right near the start where you can boost over a pool of water. It’ll save you a lot of time and you’ll fly past any close opponents. If there is any saving grace about this course, it’s that it’s shaped like a Yoshi. And if you’re interested, there’s a Yoshi helicopter (from Yoshi’s Island) flying around close to the end. 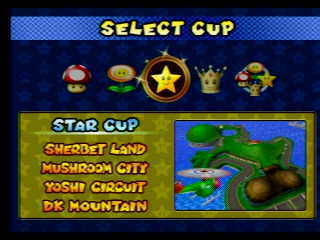 The final course of the normal cups, DK Mountain, is one of the easiest to win. On any difficulty. After you get shot out of the barrel cannon, it’s just a bunch of cliff to fall down, so don’t bother staying on the track. Then there are some hairpin turns which can be easily taken by pro drifters, and finally a huge pit that even the AIs fall into regularly. The only tricky part is not falling off the bridge when it’s cluttered with objects. Other than that, very, very easy course. Once you manage to finish a cup, and get 1st place, you’ll go to the awards ceremony. 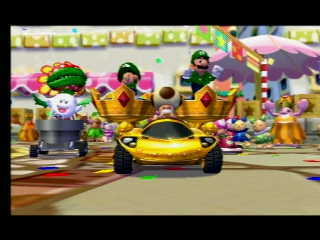 There you’ll see a bunch of Piantas and Nokis cheering for you while you’re driven around in a huge gold kart by Toadsworth. I really like the ceremony, because it’s got a great Super Mario Sunshine remix/medley kinda thing going on, and it’s just a great piece of music. Then you’re presented with a trophy, which get more and more extravagant for each cup. When you get a gold trophy for the first time, you’ll unlock something in the game, such as characters, new play modes, karts and more. I have all the gold trophies, so I’ve unlocked everything and as far as I care, I’ve finished the game. And just in case you don’t trust me, I even took a pic of the records screen. See? All golds on the All Cup tournaments. That means I’m the best. Sure, my times aren’t super-good, and I don’t have perfect scores, but I still have all the trophies. I suppose you’re waiting for the actual review, so I’ll get to that. Now. First is music. I enjoy most of the music in this game. Some is a little repetitive, but other than that, it works. Most of the songs are remixes from other games, so if you’re a Mario Kart fan, you’ll probably recognize a few of them. 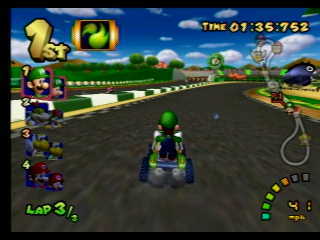 The Rainbow Road remix is especially catchy, and suits the last track of the game very well. As for voices, they’re good, but few. Not to say the characters don’t talk a lot, they just don’t say a lot of different things. And of course, the sound effects are just fine. The graphics are beautiful, on the whole. Much like several other games, the levels themselves look marvelous, and you can even see a lot of things off in the backgrounds. 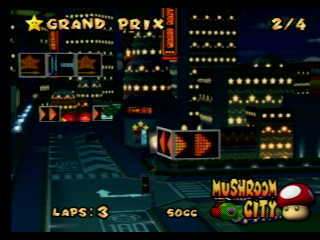 Once again, Rainbow Road goes above and beyond, providing a track that is great just to look at, with a huge city of lights beneath. The characters are a bit, I dunno, “shiny” on the character select screen, and they’re a bit blocky in-game, especially in the hands area. But since you only see close-ups at the end of a race, it’s not so bad. Controls are very solid and easy to learn, just like every other Nintendo game. Steering is never a problem, and drifting is very easy to do and will become one of the key parts of winning the game. It’s easy to learn to play as two characters at once, and if you’ve got a friend playing too, you only have to worry about doing your job. The gameplay is clearly where this game shines. It’s a fun game to play, and gets really great when you’ve got 4 or more players going at it. The Grand Prix mode should keep players busy for some tie, because there’s a lot to win, and it’s not exactly a cakewalk. The only gripe I have (and have had since the first Mario Kart) is that you can’t play the battle games against AI. The Bob-omb Blast game is extremely fun, and I rarely get to play because my family is too chicken to play against me. One other smaller problem is that if you don’t have people to play with, it gets kinda boring after you’ve gotten everything. Overall, the game is great. 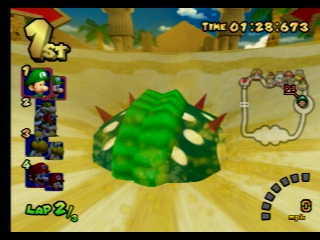 Not the best Nintendo racer on the GCN, but it is the only one where you can get eaten by a sarlaac-esque Piranha Plant. If you can look past the little things and the lack of single-player replay value, you’ve got a great game on your hands. The LAN option sounds good, but it requires a lot of stuff that I don’t have, like two broadband adapters and two copies of the game. But despite that, I’m gonna give this game a final mark of A-. I don’t get to play multiplayer a lot, and Kirby’s Air Ride and F-Zero GX don’t need multiplayer to stay interesting. So that’s what I think, and I’m sticking to it. Like always, buy it if you want, but I suggest renting it first. And that’s it. That’s my review of Mario Kart: Double Dash!!. Expect to see more reviews up in the future, because I’m starting a new policy of reviewing every game I rent that I really like. Any others will get mini-reviews. I can’t really think of anything else besides what I have ready now, so I’m asking again if anyone would like to write a guest article. I’ll take anything, as long as it’s tasteful. It doesn’t matter how many words or if it’s horrendously boring. Bring content to me! Seeing as I said in a news post that I’ve got two articles on the way, you’ve probably deduced that this is one of them. Indeed it is, and the next one should be out soon. It might be a bit shorter than usual, and it’s a nice change from video games too. After that, I think I’ll write something about my new TMNT toys. Really, I just want to show them off and how they’re so much better than the original ones, so I don’t know exactly how I’m gonna do it. So that’s it for today. I’m out.